We all know we each have an inner life and an outer life. The outer life embraces our Earthly, physical environment, placing humans between Heaven and Earth. Our inner world of thoughts and emotions has an equally important role. Inner Feng Shui broadens our outlook to acknowledge the breadth of possibilities and potential our inner life offers. This wisdom illuminates the lesson that circumstances of our inner thoughts and feelings are reflected in the outer, physical world around us. Inner Feng Shui asks us to be aware of this connection and consciously choose thoughts and emotions that support our goals. 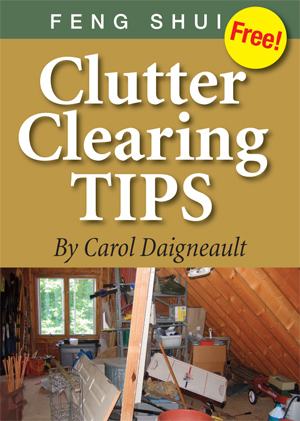 When making a recommended Feng Shui adjustment it is as valuable to hold a clear uplifting intention of the results we are pursuing as it is to move something in our environment. Our thoughts, as “things”, impact the results we achieve in our lives. During my Feng Shui studies, various teachers have shared a common concept that describes Inner Feng Shui for me: Feel Good. Awareness of the role our feelings and emotions play in our lives can lead us to improve our Inner Feng Shui to live a better life. The benchmark, the goal, the inspiration is to Feel Good. What reaction is created within you every time you encounter that broken lamp, cluttered counter or an ugly paint color? Frustration, confusion or dissatisfaction disrupts our flow and keeps us from fulfilling our desires. Conversely, being happy when you drive up to your freshly painted front door, relaxing each morning because you know your phone is in the charging station or drifting off to sleep feeling like royalty in a beautiful bedroom sets you on a trajectory of good feelings that can only attract more good into your life. 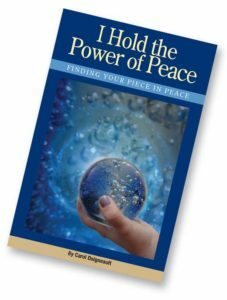 I expand on this concept in my book, I Hold the Power of Peace. 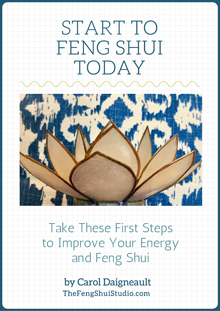 This 48 page inspirational book delves more deeply into the process and potential of Inner Feng Shui, offering specific background and techniques to enhance and harmonize your inner life. An additional element of Inner Feng Shui involves our acceptance and involvement of the conscious development and utilization of our intuitive skills. The material world is always interacting with the unseen energy around and within us. When all of our physical changes have been made and the results are less than expected, an esoteric cure (such as meditation, affirmations or visualization) can be added to achieve positive outcomes. Even better, couple your initial adjustments with intention or an esoteric cure to strengthen results.